The Judge J.N. Campbell house was completed in 1872 and was bought by J.N. Campbell, the first Gregg County judge around 1895. The home was originally constructed in the Queen Anne style but was renovated in the early 1900s in the Neoclassical style. Longview was established in 1870 adjacent to the Southern Pacific Railroad. 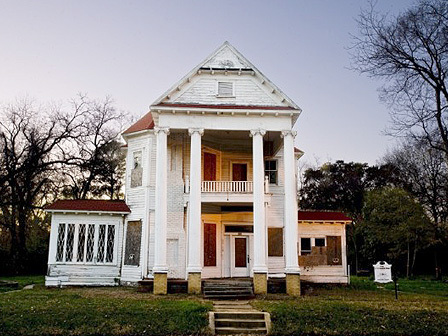 As the home of a prominent judge, the structure played host to Texas jurists as well as business and political leaders. J.N. Campbell’s brother, Thomas Mitchell Campbell (1856-1923) served as Texas governor from 1907 until 1911 and was a friend of James Hogg. The house is vacant. A preliminary evaluation found evidence of structural distress caused by damaged floor joists, foundation settlement and water damage. The community is taking an active role in revitalizing Longview and the restoration of the Campbell house will encourage other preservation efforts.